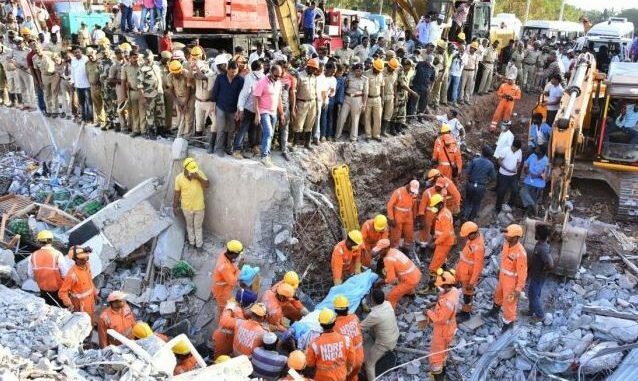 Twelve people were killed in an under-construction five story building collapse in India’s southern town of Dharwad. About 400 rescuers are on site scouring through tonnes of concrete and steel. Close to 60 people were pulled out alive, and there is a possibility that there are more people trapped below the debris. It has been three days since the building came crashing down, cheap low quality construction material and poor regulations are mostly to blame for the incident. Earth movers, cranes, sniffer dogs were deployed to help with the rescue work. Police have charged the builder of manslaughter, however he still remains free. The police hope to nab him once the rescue work is completed. A week before this incident, a foot over bridge came crashing down in Mumbai. Six people died and more than thirty were injured. After the fatal incident auditors who inspected the safety of the bridge were taken into custody. Hundreds of Indians live in old buildings, many of which are susceptible to collapse during heavy rain. However by bribing officials regulations are evaded.